Highly specialised offshore service vessels. GMS offers a comprehensive range of services through our modern and high spec fleet, to meet the high demand of the oil-and-gas industry for offshore service vessels. We operate a fleet of highly specialised, new generation service vessels for your offshore operations. Chevron, BHP Billiton, Woodside Energy Limited, Inpex and Shell have all employed Gun Marine Services for various offshore services. Based in Exmouth, Western Australia, GMS is a family owned business with over three decades of experience in the oil and gas industries. Our locally employed staff have extensive knowledge of the local area. Western Australia is home to some of the world's most valuable resources – primarily oil and gas. Exmouth plays a vital role in providing a home port to most WA offshore industries. 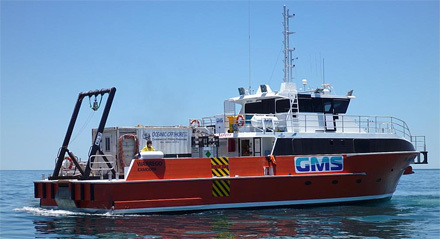 GMS offers all clients' competitive rates on all marine services including oceanographic surveys, equipment transfer and dive shore logistics support.We can conveniently and easily satisfy most clients' requests regarding equipment transfer, oceanographic survey, shore logistics support and more. GMS offers clients the opportunity to make use of our large lay down yard. Located just 1km from the harbour, we have a space large enough to encompass the spread out and organisation of goods prior to loading vessels for offshore departures. GMS offers a 24 hour phone assistance service with extensive industry knowledge and understanding. We ensure that someone - either the Fleet Master or Marine Operations Manager, will always be available to assist with any offshore logistics support or issues pertaining to oil spill contingencies, equipment transfer, oceanographic surveys and more. When looking for a service provider based in Exmouth for your offshore requirements, look no further than GMS. Receive a superior service from a family owned company with over 30 years of experience in operating in oil and gas in Exmouth. Contact us today for information and advice on equipment transfers, offshore logistics support, oceanographic surveys, offshore service vessels and more. Do business with people who know what you need.